From the moment the steam engine was invented its potential to power ships was clear. The challenge was how to transfer the energy created by the steam engine to actually power a ship. After a number of failed designs, William Symington, a Scotish inventor, solved that problem by designing a paddle wheel. Symington's application was to move boats on canals. The steam engine could not compete with mules moving the boats for that purpose. However, American inventor, Robert Fulton took Symington’s ideas and applied them to building a boat that could travel on the Hudson River. Fulton’s work was financed by Robert Livingston. Livingston had convinced the New York State legislature to grant him a monopoly on steam travel in New York, if he could provide a boat that could travel from New York to Albany at the average speed of 4 MPH. 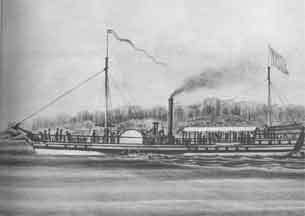 Fulton built a boat, in New York, which became known as the Clermont. Fulton made use of an imported steam engine from the Watt steam plant in England. The boat was 146 feet long, and 12 feet wide, with a flat bottom. It had a wrought iron paddle wheel and metal boilers. On the morning of August 7th 1807, the Clermont left its pier in Manhattan and headed for Albany. Thirty two and a half hours later, the Clermont arrived in Albany. The ship had traveled the one hundred and fifty mile journey at an average speed of 4 and half miles an hour. The world had been changed.